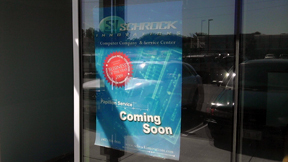 Schrock Innovations’ new Papillion, NE Service Center is coming along, so I thought I would post a construction update. Things have been busy lately, so these pictures are about a week old. Since they were taken electrical and data wiring is in place, the bathroom is complete (very important!) and Carberry Construction is starting on the floors. 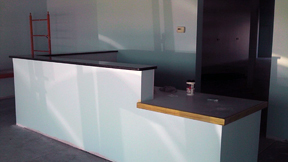 The front desk is in place. Carberry fabricated the desk and topped it with black granite. We implemented a new feature in the front desk of the Papillion Service Center. Notice the lowered section of the front desk. We need the front counter to be tall enough for check writing and service, but sometimes it is tough for our customers to lift their computers up there. The new lowered section is an experiment to see if we can get the best of both worlds. 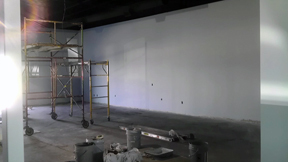 The walls have been painted and the hanging electrical drops are in place. We are just waiting on the floors to begin bench installation, inventory shelf delivery, and utility hook up. If everything goes well, we are planning the grand opening for the weekend of October 8th. That is great news to hear you are expanding once again! Keep up the good work. What are some of the ways you were able to revise some of your methods to work for your third store? I’ve been following you for a while, then I lost track. So glad to see you’re making (more) progress – especially in today’s world.